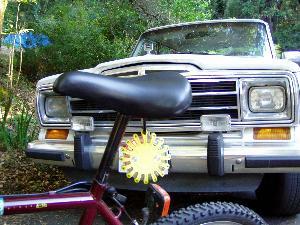 According to government statistics, most bicycle accidents occur when a vehicle strikes the side of the bike ("T-bone," sideswipe or broadside crash). Unlike other bike lights, the PowerFlare unit emits light in all directions from an array of ultra-bright LEDs, providing critical visibility to the sides of your bike. Whether you're a serious cyclist or just biking for fun, you deserve the superior all-angles protection that our unique product provides. 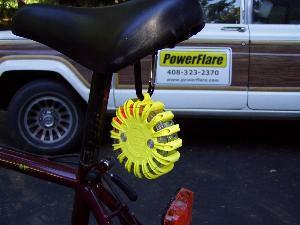 Click here to see a PowerFlare® unit clipped to a bike. 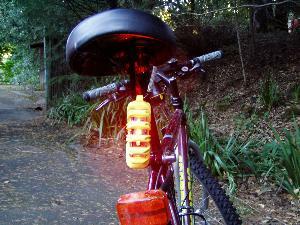 Click here to see a PowerFlare® unit compared to a normal LED bike tail light. Super-bright LED array can be seen for miles at night, but is bright enough to provide you extra protection during the day, as well. PowerFlare units clipped to seats, saddlebags or backpacks can provide 360° coverage. Lateral illumination, a common weakness of other bike lights, is provided. PowerFlare units are about the size of a hockey puck. They can mount just about anywhere: use carbiner clips, tie-wraps, etc. PowerFlare units can be used for traffic control, as a warning light, as a rescue beacon, and so on. Because they are watertight and non-reactive, they can be used in places where old-fashioned flares would be dangerous, such as in dry brush or in the presence of gasoline. Plus, you can use them while hiking, rollerblading, and many other sports and activities. PowerFlare products are designed to benefit your safety. Don't settle for anything less. To place an order, please visit our purchase page. Clip PowerFlare units to your bike seat post, saddlebag, belt or backpack!. Vehicle drivers can see you from the side. If you cannot view certain ".pdf" files on this site, you may need Acrobat Reader.